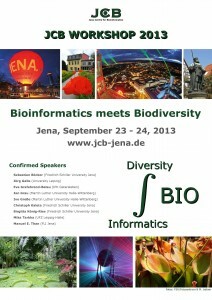 Here are some news concerning the JCB Workshop “Bioinformatics meets Biodiversity”, 23-24 September 2013. 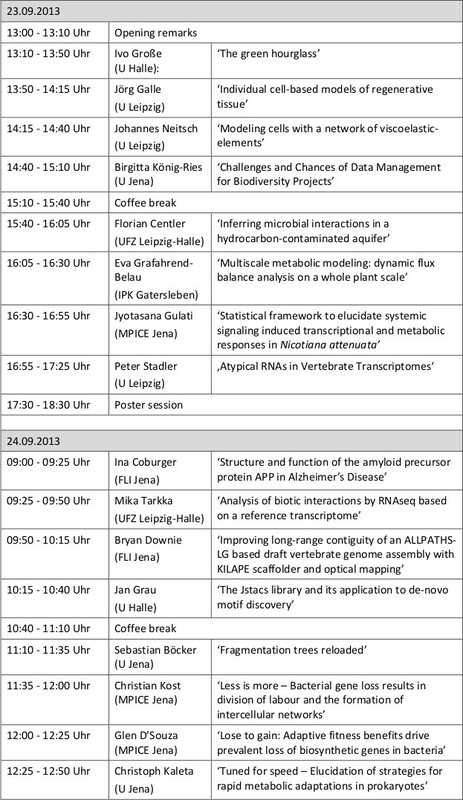 The workshop will take place in the “Rosensäle” in Jena, Fürstengraben 27, and will start on Sept. 23 at 13:00, talks will be given until 17:00, followed by a poster session until 18:00. On Sept. 24, sessions are planned from 9:00-13:00. The PosterAbstracts you can download here! We would be grateful if you could advertise the workshop in your or neighbouring groups. Participation is free of charge and includes the workshop brochure and catering at coffee breaks, but requires registration by email at jcb_workshop@listserv.uni-jena.de.